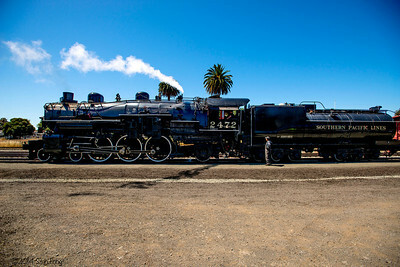 Under the auspices of the Golden Gate Railroad Museum, I had a chance again (with Glenn Hazen) to run Southern Pacific 2472 this Memorial Day. 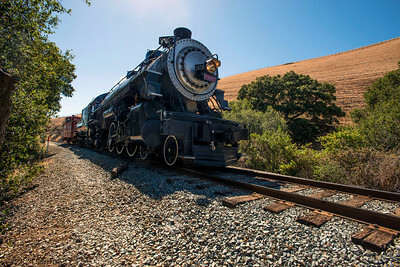 Our first time running SP 2472 was last year's Labor Day, and I'm hoping that they'll have the Run-A-Locomotive again this Labor Day. 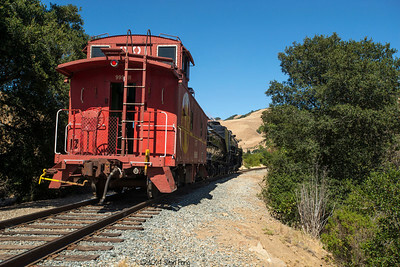 Peering out of the ATSF caboose, we sit back and relax and let the engineer before us run SP 2472 up and back from Niles Depot to Dresser Bridge. 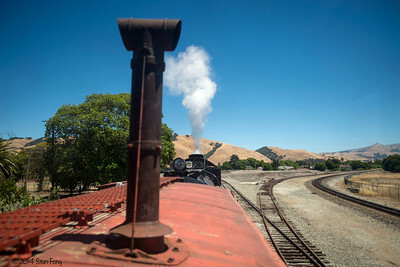 2472 simmers at Niles Depot waiting to make her second run up to Dresser Bridge. 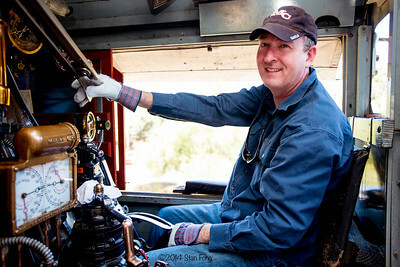 Glenn posing for a quick shot before backing 2472 off of Dresser Bridge. 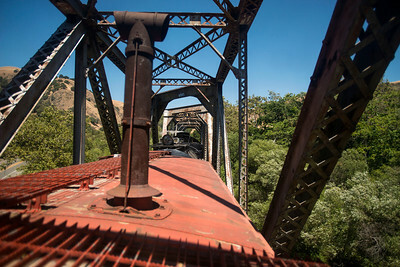 Looking out the cupola of the ATSF caboose, we see that the engineer before our turn has opened the throttle and is leading us to Dresser Bridge. 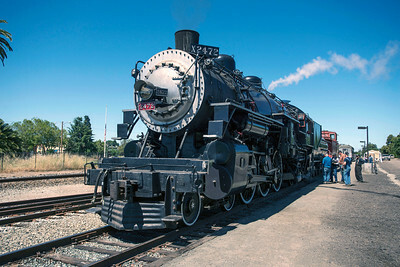 Here 2472 has stopped at Dresser Bridge, where we will begin backing down to the yard limit. 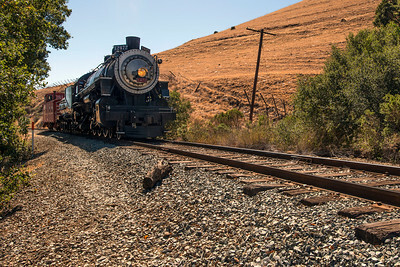 The last run of 2472 - she will go up to Dresser Bridge and back, then the crew will couple the Southern Pacific Business car "Oakland" onto the caboose and head up to Brightside Yard to end the day. 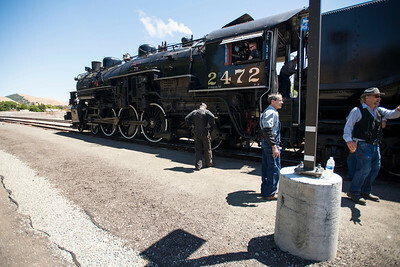 SP 2472 has just backed down to Niles Depot and here you see the engineer prior to our run talking to the crew. 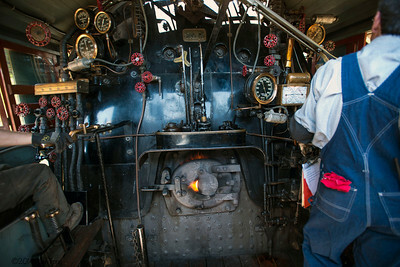 Here's the inside of the busy cab of 2472. 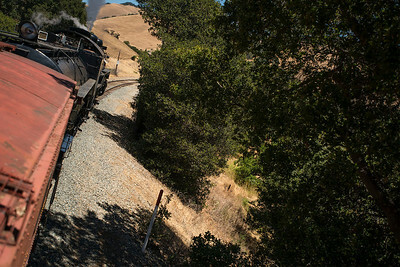 After our turn to run 2472, we decided to capture the last engineer running 2472 up to Dresser Bridge. 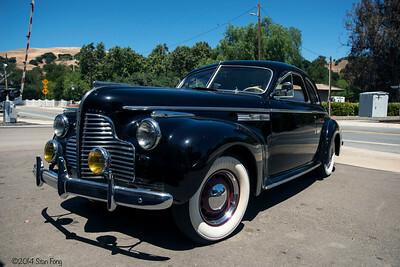 This vintage 1940 Oldsmobile was parked right outside the Sunol Railroad Cafe today. 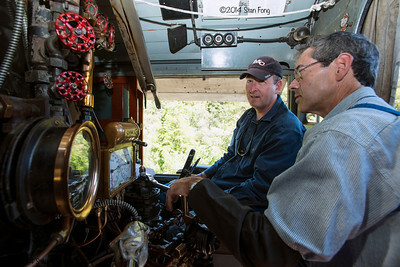 Here Glenn is receiving last-minute instructions from Don, who is one of 2472's engineers. 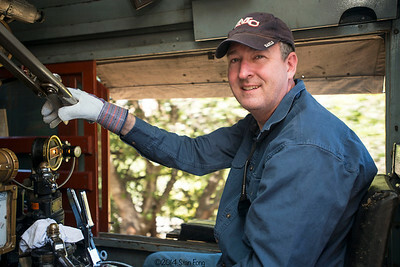 Garrett (in the fireman's seat), Don (engineer, standing on the left of the light standard) and Dave (GGRM's operation manager) at Niles Depot. Glenn, hand on throttle, gets ready to back 2472 off of Dresser Bridge, where I had just stopped.